This week’s B-Green Collaborative feature story highlights Climate Interactive’s tools and their role in providing important information to climate negotiators. The article begins by discussing the overall details of the C-ROADS model inputs and its potential uses in policymaker decisions. It proceeds to give a short analysis of our Climate Momentum and Dynamics tool, which was created to quickly display a pre-calculated set of climate scenarios based on actual C-ROADS output. Using this tool, they conclude that “if the people of the earth don’t change their ways, we will live in a world far warmer than it has been for the last 650,000 years…with an atmosphere and oceans far different than anything man has experienced before.” Thus, it is important that all nations work together to arrive at a path for reduction. 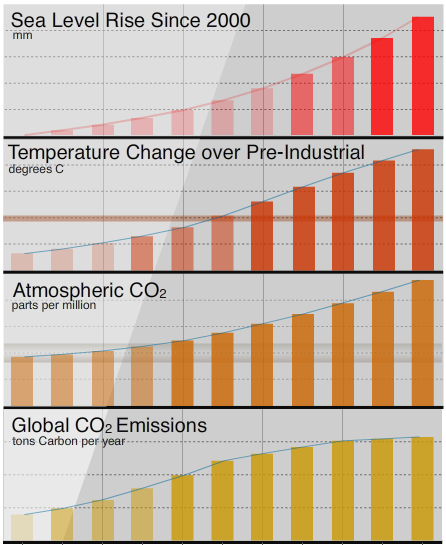 For more information on C-ROADS or to try out the Climate Momentum and Dynamics simulation, visit our Climate Interactive website.